This floral tapestry "Bouquet Exemplar Black" shows a lovely bouquet of flowers in a dark background. Floral still life pieces in French art exemplifies the beauty of nature, and here in this piece, we see a gorgeous arrangement of flowers in a variety of reds, apricots and violets, perches in a copper vase on a column. The work shows off the beautiful colors of flower blooms and the intensity of beauty that nature can bring. 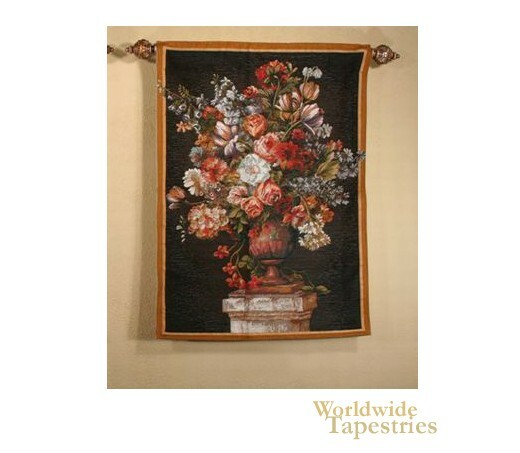 Full of beauty, this French floral tapestry "Bouquet Exemplar Black" is backed with a lining and has a rod pocket for easy hanging. Note: tapestry rod, where pictured, is not included in the price.